A nurse was charged with second-degree murder and unlawful use of a firearm. A Missouri nurse is facing a murder charge after she told police she accidentally shot her boyfriend in the head during a whiskey-fueled re-enactment of a scene from a movie they were watching that involved a firearm, police said. Kalesha Peterson, 37, was arrested after she called 911 claiming she shot her boyfriend, David Dalton, 36, in the bedroom of their home in Fulton, Missouri, about 100 miles west of St. Louis, police said. 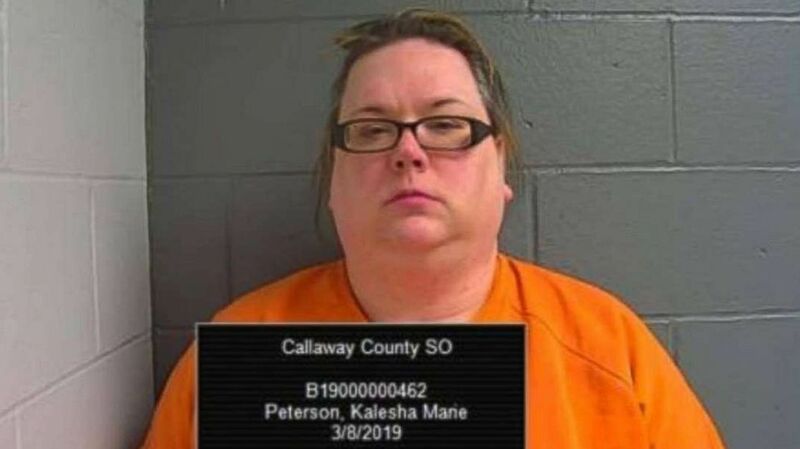 Peterson told police that she and Dalton were drinking whiskey and that she had also taken prescription drugs before they began acting out a scene from a movie, according to a probable cause affidavit provided to ABC News Monday by the Callaway County Prosecuting Attorney's Office. (Fulton Missouri Police Department) Kalesha Marie Peterson in a police photo dated, March 8, 2019. "Drinking and playing with loaded weapons is not a good thing in any manner or sense," Lt. Bill Ladwig of the Fulton Police Department told ABC affiliate station WMIZ-TV in Jefferson City, Missouri. "This was just an unfortunate isolated incident." According to records from the Missouri Board of Nursing, Peterson became a licensed practical nurse on Aug. 22, 2017. Peterson was charged with second-degree murder and unlawful use of a firearm, according to the Calaway County Prosecuting Attorney. She is being held on a no-bail warrant at the Calaway County jail, pending arraignment on Friday, according to court officials. She has not yet entered a plea. The Missouri State Public Defender's office said Monday that it had not been appointed to represent Peterson. It was unclear if she has retained a private attorney. Peterson called 911 at 10:22 p.m. on Thursday, telling a dispatcher that she had just shot Dalton and requested immediate medical attention, according to the probable cause affidavit. When officers arrived at the couple's home, they found Dalton in a bedroom suffering from a gunshot wound to the head and began attempting life-saving measures before medics arrive, according to the document. Dalton was declared dead at the scene. "Peterson admitted that she had been drinking whiskey and that she was intoxicated," the probable cause affidavit reads. A bottle of whiskey was found in the bedroom where police officers found Dalton, according to the affidavit. During an interview at the Fulton Police Department, Peterson told detectives she shot Dalton with a .38 caliber Taurus revolver that Dalton had used weeks earlier and had not removed all of the bullets from the weapon, according to the probable cause affidavit. "After being advised of her Miranda rights, Peterson advised that she and Dalton had been watching a movie and drinking alcoholic beverages that evening," the affidavit reads. "Peterson advised that at some point Dalton suggested the two play out a scene in the movie that involved a firearm." The affidavit does not identify the movie the couple was watching and police did not disclose the title of the film. "Peterson stated that she had the gun in her hand when the gun discharged," according to the affidavit. "Peterson stated that she attempted to stop the bleeding from the gunshot to Dalton's head." Police investigators discovered two spent shell casings in the revolver but said Dalton was shot once. Peterson voluntarily provided police a breath sample that confirmed she had consumed alcohol, authorities said. "It should also be noted that Peterson advised taking several medications," the probable cause affidavit reads. "While at the residence, officers did note prescription medications in bottles with Peterson's name. Some of those prescriptions included medications known to increase impairment when used with alcoholic beverages."